With so much knowledge and expertise to call upon within our team, we hope you take full advantage and contact us if you need any advice on new equipment. Working with a range of exciting and world leading brands, in many cases, we will be able to identify and recommend the perfect fit for you within minutes, saving you valuable time and resource. If your existing fan has stopped working effectively, let our skilled engineers use their expertise to help. We know from vast experience that when attempting to identify the source of an issue and relay that information to us, customers can become frustrated. Save valuable time and effort, and in many cases money, by booking an initial inspection, undertaken in our specialist workshop. How to Choose a New Fan? Industrial fans and blowers are there to control odour in scrubbers and oxidisers. Biofilters assist in the elimination of odours present in wastewater and sewage treatment systems, paper mills, recycling plants, and systems that result in polluted air, steam, or mist. When replacing a fan, there are specific questions to ask. For example, do you need an axial flow? High temperature? In-line? If you’re not sure the answer to these, then give us a call, we are happy to help. Sometimes bringing your old unit to our specially equipped workshop can be a great option. This allows us to see what has (or hasn’t!) worked for you, and what the replacement options could be. Or if a replacement fan is definitely on your wish list, we can offer you a large selection. 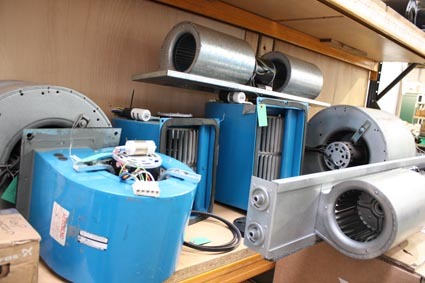 If you need a replacement fan we stock a large selection with access to many more via our trusted suppliers. Take a look at our brands page to see the full range of fans available. We have access to the latest products from companies such as Vent-Axia, Victoria Fans, Elta Fans, London Fan Company, Ziehl-Abegg and EBM-Papst. All equipment must be kept in good working order to comply with H&S guidelines and legislation. Whether in a residential or commercial environment, your equipment must be fit for purpose. A simple maintenance schedule can ensure all equipment is in working order, allowing for less downtime for your business and of course, peace of mind for you. It’s vital to consider the equipment’s maintenance and servicing requirements. Any investment that allows for the efficient and profitable operation of your business must be maintained. But in the event of a breakdown or necessary repair, you can rely on our prompt assistance. In the majority of cases, repairs can take place on site by our skilled engineers; however, where necessary we’ll return to our specialist workshop to identify the issue. We have access to a broad range of spares and a highly skilled and experienced team waiting to assist. We guarantee that customer service is a priority at AES Rewinds and we will do everything possible to get your equipment operational in the shortest possible time. To minimise the risk of breakdowns that can severely impact the smooth running of your business, we have maintenance plans to suit virtually all equipment and budgets. If you have any questions about any of our products or services, email our friendly team or give us a call on 01252 515169. Or visit us at our base in Ash Vale, near Farnborough. We have easy access from outer North West London, and across the South West to the South East of England.